No, it's not Really Reasonable Ribbon's Birthday. Not that I'm aware of, anyway. But it is my cousin's birthday next month; so I wanted to create a soft, sweet birthday card for her. I used some of my favorite Crate Paper products along with some sweet coordinating ribbons and trims from Really Reasonable Ribbon to embellish it. Really Reasonable Ribbon, no kidding, always has the PERFECT ribbons and trims for EVERY project. Their choice of colors, textures, prints and widths is absolutely endless. The papers I used literally matched up perfectly with the ribbons I used on my card. After I laid out my patterned papers and had my design layout completed, I inked and machine stitched the papers. 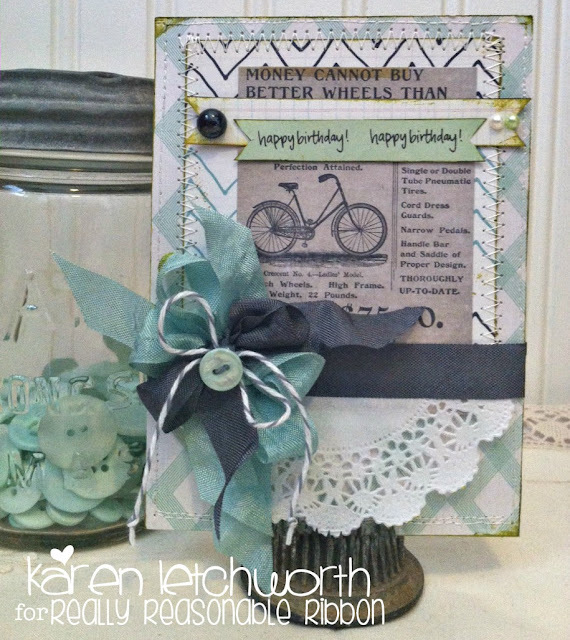 I used a couple of little strips (the banner and the sentiment), as well as another piece of ephemera from Crate Paper in the background, and placed a half of a white paper doily at the bottom of my card. Well, as I've said before.....no card is complete without a bow. This one just looked "naked"; and I knew that I had the PERFECT Really Reasonable Ribbons to give this little card just what it needed. I ran a length of the gorgeous Seam Binding in Charcoal Gray across my card, and also included this same Charcoal Gray Seam Binding, Bay Leaf Seam Binding and Oyster Baker's Twine in my bow. I placed a coordinating button in the center of my bow that has a small piece of Solid Gray Baker's Twine tied into it. I thought about adding some of Really Reasonable Ribbon's gorgeous Mulberry Flowers, but decided to just keep it simpler this time. I really want to mention that the Bay Leaf Seam Binding I used on this project is the perfect shade of light greenish teal (I'm not great at explaining it) that is SO popular right now. It matches so many of the popular patterned papers that are on trend right now. But that's one of the many things that I love SO MUCH about Really Reasonable Ribbon.....the way their vast array of choices will match perfectly to any project you might be creating. Why not stop by Really Reasonable Ribbon and check out ALL the wonderful ribbons, trims, laces, twines, flowers, embellishments and more. Christmas is coming, and you can create a "Wish List" to give your family. That way, you're sure to get what you really want. 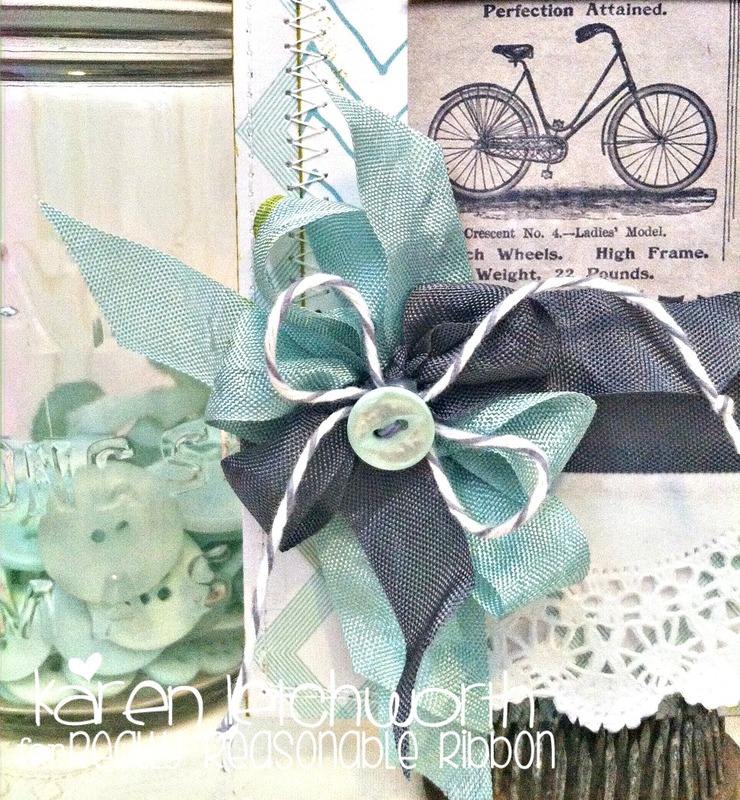 Gorgeous ribbons and trims from Really Reasonable Ribbon are the perfect accent to ANY project. Don't forget about the FUN CHALLENGES on the Really Reasonable Ribbon Blog where you can enter all your ribbon-topped projects. We always LOVE having you play along in our challenges. You're also welcome to visit my blog, My Cup Runneth Over, to say hello. I always enjoy your visits. Karen, this is gorgeous! Love the color palette! oh Karen, every single thing you make is just so soft and sweet - like YOU! :) thanks for letting us know about the bay leaf seam binding. guess I should go ahead and just order a bunch. ;) I so love that color! it looks gorgeous paired with the grey.